Love is one of the most oft-depicted subjects in art. Whether it’s a wedding scene, a scandalous tryst, or innocent affection, each century has multitudes of love-themed art to offer. So which ones come out on top? It’s hard to tell, but here are some favorites from the past three centuries. 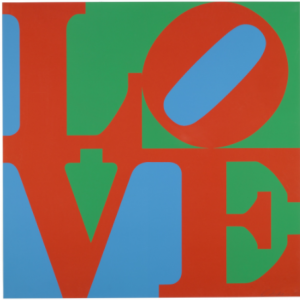 Robert Indiana (1928-2018), LOVE, 1967, screenprint, 33 15/16 x 33 15/16 inches. Collection of the MOMA. © 2019 Morgan Art Foundation Ltd. / Artists Rights Society (ARS), New York. A simple design. An ‘L’ and an ‘O’ on top of a ‘V’ and an ‘E.’ Many versions of Indiana’s work have been created and displayed around the world – including here at the MOA. It’s an image that has been sold by the millions over the years. The composition of the four letters communicates a message that is as universal as the language of art. It was originally designed as a Christmas card and grew immensely in popularity from there. Want to see why? Come see it in sculpture form on the third floor of the MOA. Pierre Auguste Renoir (1841-1919), Dance in the Country, 1883, oil on canvas, 71 x 35 inches. Collection of the Musée d’Orsay. Renoir has depicted a perfectly romantic scene – the remains of a shared meal in the background, a dance so lively it has knocked the gentleman’s hat to the ground and a woman’s charming smile to accompany it all. The smile belongs to Renoir’s future wife – Aline Charigot. The painting invites the viewers to join in the celebration and dance with the same amount of spontaneity and romance the couple exudes. 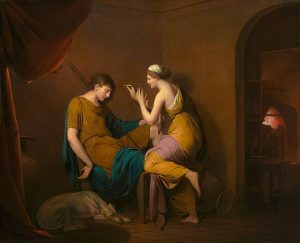 Joseph Wright of Derby (1734-1797), “The Corinthian Maid,” c.1734, oil on canvas, 41.8 x 51.4 inches. National Gallery of Art. This delicate scene depicts Dibutades, the daughter of a potter in Corinth, and her sleeping lover. The lover is set to embark on a perilous journey outside the city. As he sleeps, Dibutades traces his silhouette on the wall so her father can create a clay relief of the outline for her to remember her lover by. It’s a heart-warming depiction of the classic Greek tale that has viewers rooting for the lover’s safe return.